Erin owns her own company, writing from home or occasionally at a coffee shop. She rarely meets with clients so her style is very casual but she doesn't want to look sloppy. She is looking for some different outfit suggestions that will be an easy "go to" so she doesn't have to struggle so much with the classic "what to wear" question we all ask ourselves when staring into the closet in the morning. Also a note - she lives in Chicago so it gets pretty cold in the winter months. I too work at home for the most part but I just feel better when I wear something that is more put together than a sweatshirt and jeans. It's easy to get into a rut, but here are four classic outfits that I always know will work for me. Hopefully they will work for Erin too. 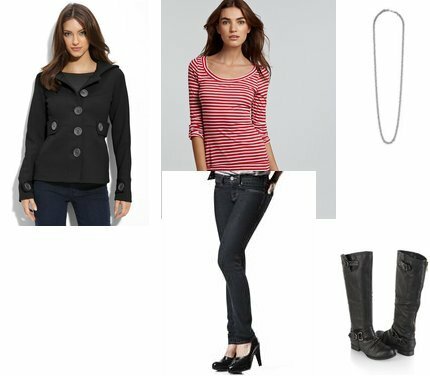 I love a striped tee on it's own with jeans and boots in winter/flats or sandals in summer, but I also love layering with a military inspired jacket like the one shown. This jacket would also go with plain shirts, or other embellished/printed shirts. Anthropologie has a lot of good ones - or Shop Ruche (although they sell out fast) is great for those on a tighter budget. A plain black tee or sweater is a classic look - again with jeans (any kind), a skirt in the spring (or paired with a skirt/tights in the winter/fall). You can mix up the footwear with boots as shown, pumps, flats, whatever you prefer. I picked a leopard scarf because leopard is classic (in my opinion) but any printed scarf would pop against a plain top (and this goes for any color top, not just black). This blazer is almost sold out online but it's a great example of a classic, yet unique jacket. I love jackets like this because they make any outfit look instantly polished - even with just a plain tshirt or tank underneath. Take any pretty top (patterned or embellished) and throw a longish fitted cardigan like this one from J Crew over it. The shirt is great on it's own in warmer weather but the cardigan adds a warm layer for fall and winter. You could also change out the boots for flats if you prefer - or maybe wedge sandals in the warm months. I could so use this. I especially love #1 (because I have the pieces) and the last one. Pretty shell. I work from home, and this is just the kind of thing I am trying to do so I don't have to worry about my appearance and change my clothes every time I go out. Excellent advice.